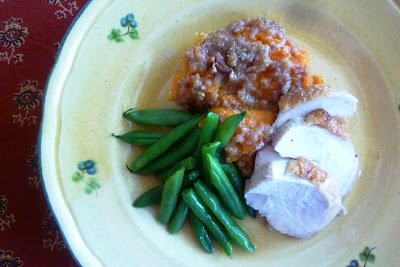 During my first year as a blogger I posted an extensive series of Thanksgiving recipes as we approached the big day. Because I love the Thanksgiving holiday so much I have continued to add one or two items to this parade of Thanksgiving appropriate recipes every year. If you are looking for recipes to round out your Thanksgiving spread (for some reason I have never posted any of the components of the main event...turkey, dressing and gravy...maybe this year...), you could probably find almost everything you need right here. This year I wanted to add another sweet potato dish to the mix. 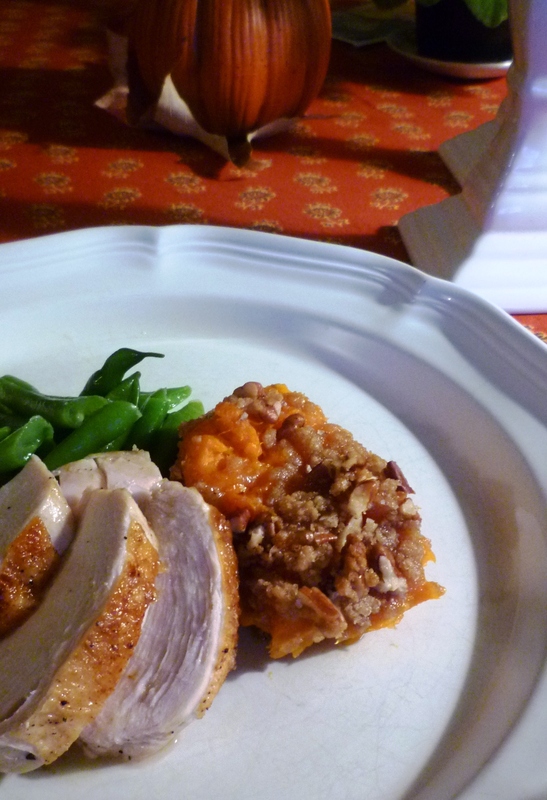 Sweet potatoes are one of my favorite things on the Thanksgiving table. They are so delicious...and versatile. Besides, I want to help convince everyone that there is so much that can be done with them other than drowning them in sugar and topping them with marshmallows. In past years—because I object so much to this sugar-laden oddity—I have posted two unabashedly savory sweet potato side dishes....one with turnips and another with mushrooms. They are both delicious....and each shows the sweet potato off to great advantage. If you think you don't like sweet potatoes, you should give one of these dishes a try. 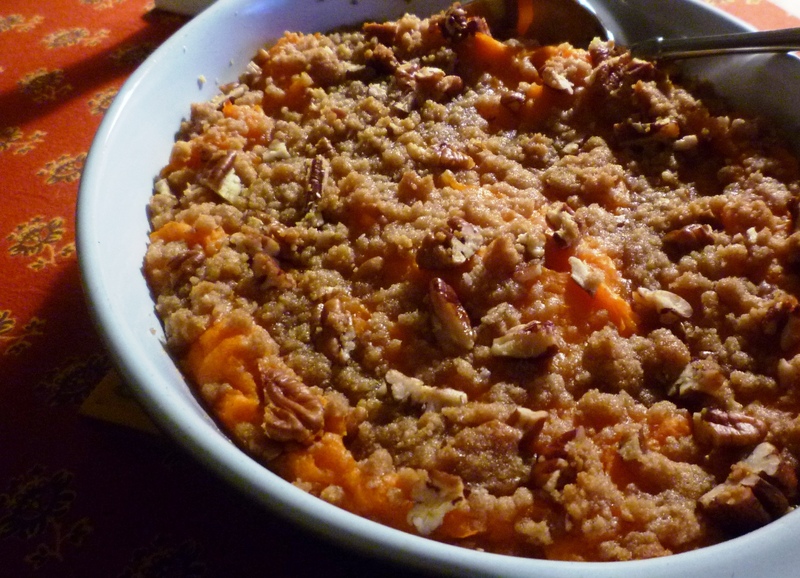 Perhaps to demonstrate that I don't entirely object to sweet potato dishes that emphasize the "sweet" side of this wonderful vegetable, the sweet potato recipe I'm sharing this year is filled with apples and includes a sweet and crunchy streusel topping. This dish would be a perfect addition to your table if you are trying to wean your family off a version of Thanksgiving sweet potatoes that includes marshmallows. The choice of apples is up to you. If you want a sweeter dish, choose a naturally sweet apple—like Golden Delicious or Gala. If you want something very tart, choose a Granny Smith. I find that I like to make it with a mix of apples (a combination of tart Jonathans with sweet Golden Delicious is my favorite)—or an apple with a strong sweet-tart character—like a Braeburn or a Jonagold. You can ramp up the apple flavor of the gratin even more by sautéing some diced apples and scattering them over the gratin before adding the streusel. To prepare the sweet potatoes, simply roast, peel and mash. I like the texture best if half of the sweet potatoes are puréed until perfectly smooth (in the food processor) and half of them are left as a chunky mash, but you could purée all of them...or none of them...depending on the texture that you prefer. 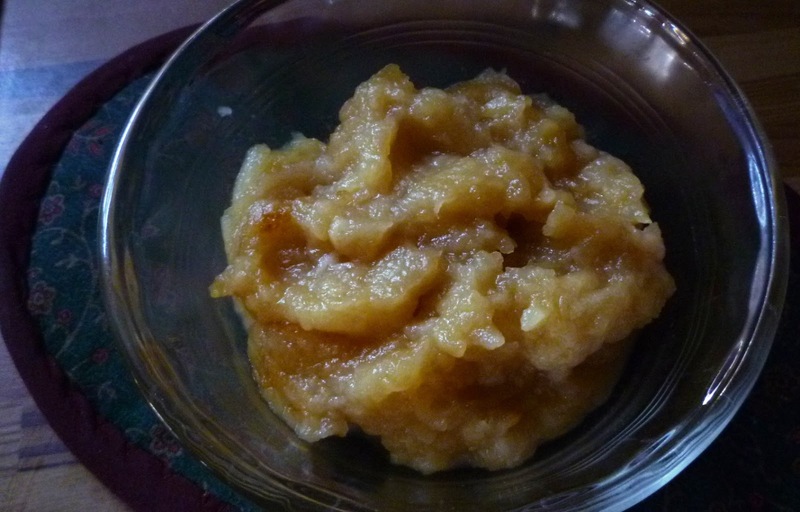 This simple mash of sweet potatoes is then enhanced with butter and cream and combined with the homemade applesauce. If you like, you can stop at this point...you will have a delicious sweet potato-apple purée, which is good not only at Thanksgiving, but it is simple enough for a weeknight meal (and exceptionally fine with a pork chop...or roast chicken). If the individual components have cooled...or been made ahead...simply reheat in a bain-marie (a bowl set over simmering water) or in the microwave. To turn the sweet potato-apple mixture into a gratin, simply transfer it to a buttered, shallow baking dish and top it with the brown sugar streusel. 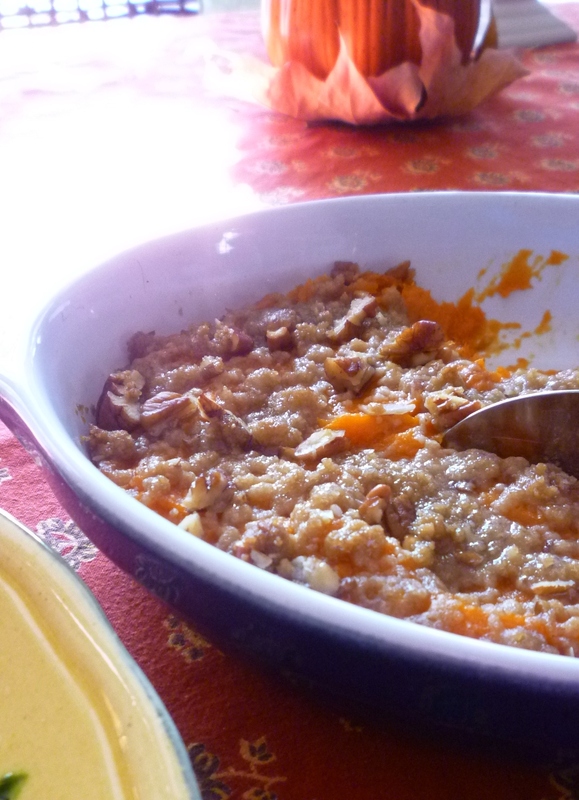 Serving it this way makes it perfect for Thanksgiving—it adds that almost dessert-like persona that many are looking for in their Thanksgiving sweet potatoes....and, it makes it so that the dish can be made in its entirety ahead of time—only needing to be heated through to make it ready for the table. 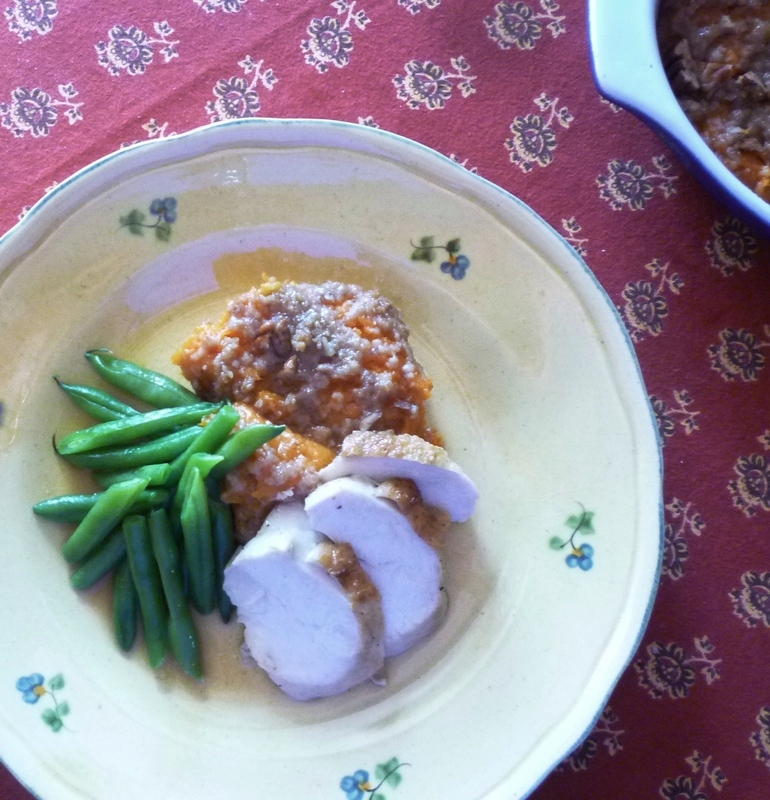 If you have ever prepared Thanksgiving dinner before you know just how great it is to have a few things that you can serve that require absolutely nothing from the cook on the day of the meal. Over the years I have noticed that the traffic on my blog picks up a bit at the holidays as people begin to do a bit more cooking than usual. If you are visiting for the first time...and are looking for some ideas for your Thanksgiving spread (and you like the look of today's post)...you should check out my recipe index...or scroll through recipes featuring specific ingredients that interest you (see the sidebar)...or look through old October and November posts.... But I also want to let you know that I have posted a few albums on my Facebook page that feature links to Thanksgiving recipes from previous years. You'll find lots of ideas for side dishes, appetizers and sweets...all featuring traditional and seasonal ingredients (there's even one album devoted entirely to pumpkin recipes...). And whether you are new here...or an old friend...I wish you all a wonderful Thanksgiving season...filled with foods you love...and even more importantly, with the people you love. Rub the brown sugar, flour, salt and butter together until the mixture forms clumps. Add the pecans, if using. Set aside. This may be made a day or two ahead—wrap and refrigerate. Bring to room temperature before using. Preheat the oven to 400º. Place the sweet potatoes in the oven and bake until fork tender—about an hour. While the potatoes bake, place apples in a 13x9-inch glass or ceramic baking dish; pour in the cider and distribute the butter evenly. Sprinkle the brown sugar over all. Place the pan in the oven and roast until the apples are soft enough to smash with a spoon and the cider is mostly absorbed. This will take about 25 to 35 minutes. Stir the apples half way through the cooking time. Scrape the apples into a bowl and mash with a potato masher for a chunky purée, or process in the food processor for a smooth purée. You will have about 1 1/2 cups applesauce. Set aside. When the potatoes are done, scoop the flesh out of their skins into a large bowl. 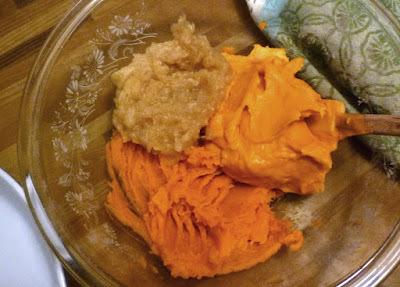 Transfer half of the sweet potatoes to the food processor along with 4 tablespoons of butter. Purée until smooth. Add the cream with the machine running. (If the sweet potatoes seem way to stiff at this point, add a bit more cream...or some milk.) Smash the remaining sweet potatoes with a potato masher or a fork. Fold in the puréed sweet potatoes and applesauce. Taste and season with salt and pepper. If the mixture tastes flat...or too sweet, correct with a touch of lemon juice. Transfer the mixture to a buttered 2 1/2 to 3 quart casserole/baking dish. (The recipe may be completed to this point a day ahead. Cover and store in the refrigerator. Bring to room temperature before continuing.) Scatter the streusel topping over the sweet potatoes and place in a 350° to 375° oven. Bake until the potatoes are hot through and the topping has crisped. If the potato/apple purée is still warm this will only take 25 to 35 minutes. If the purée was made ahead and is at room temperature, it will take 45 minutes to an hour (cover loosely with foil if the streusel is getting to dark). Serves 8 to 12.